Advances in alternative energy generation have gained dramatically in recent years. In concert with these these advances, World Housing Solution’s own development of thermally efficient, deployable structures has, for the first time, enabled a truly energy autonomous camp for austere environments. Environmental control (heating and cooling) are typically the greatest consumers of electricity, and in turn, fuel. In many cases, alternative energy is unable to meet the electricity demand for HVAC. 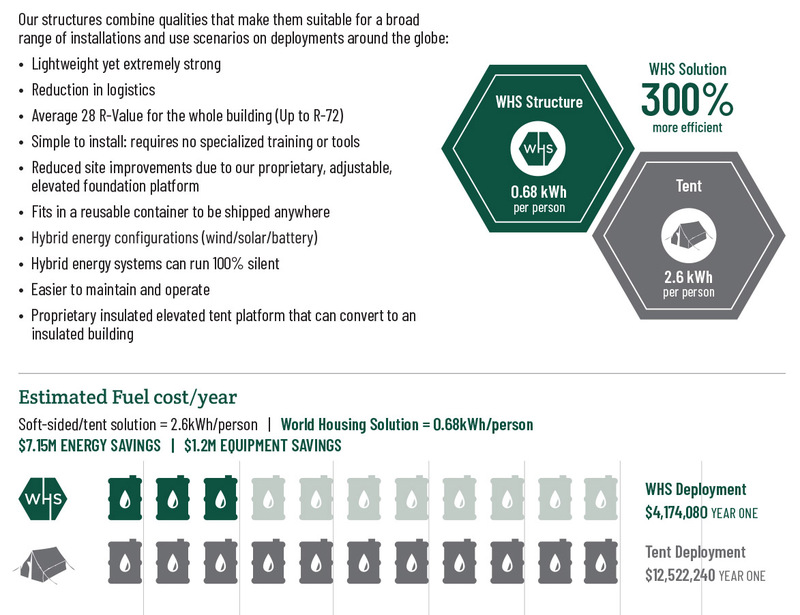 However, WHS highly insulated (up to R-72) shelters exhibit extreme thermal efficiency, reducing demand for HVAC-driven energy by up to 80%. Whether solar, wind, or water, WHS has the designs and experience to right-size autonomous shelters, camps and towable shelters with alternative energy and storage. With energy consumption drastically reduced, energy storage and alternative energy generation by solar, wind, and other methods can finally provide an independent micro grid capable of powering an island of operation.